A delicious soup that can be enjoyed all year round. Remove the swiss chard leaves from the stalks. Finely chop the stalks and set aside, then finely chop the leaves and set aside. Heat oil in a large saucepan, add the bacon and gently fry, stirring, until slightly crisp. Add chard stalks, onion, celery, garlic and potato, stir, put the lid on the pan and cook gently until onion is soft, stirring occasionally. Add the stock, bring to the boil and simmer, until the potato is just tender. Add the cooked chicken and swiss chard leaves, simmer for 5 minutes. 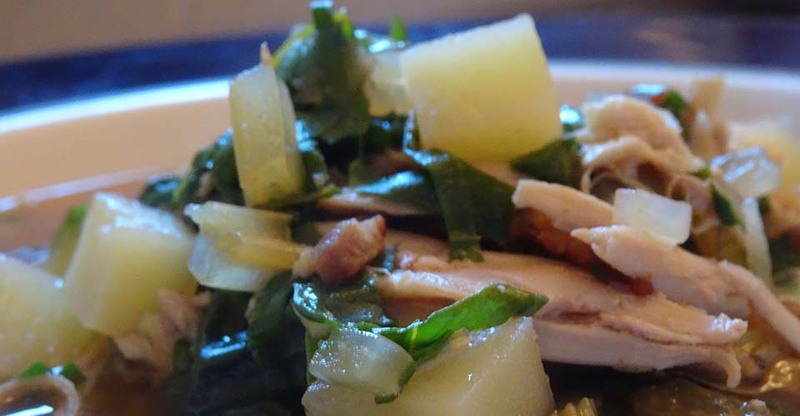 I love this soup, it’s a great way to use up left over roast chicken, but if you do not have any left over cooked chicken, you could poach some chicken thigh fillets in the stock and then shred or chop them up and add to the soup. The broth keeps the soup nice and light.